Number of pages: 302 p.
Schuyler Van Alen is a sophomore at a prestigious private school. She prefers baggy, vintage clothes instead of the Prada and pearls worn by her classmates, and she lives with her reclusive grandmother in a dilapidated mansion. Schuyler is a loner...and happy that way. Suddenly, when she turns fifteen, there is a visible mosaic of blue veins on her arm. She starts having flashbacks to ancient times. Then a popular girl from her school is found dead... drained of all her blood. 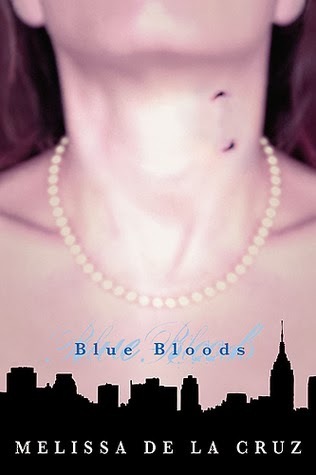 Schuyler doesn't know what to think, but she wants to find out the secrets the Blue Bloods are keeping. But is she herself in danger? I expected a lot of this book, it has a lot of high reviews and I heard a lot about it. But I was a little disappointed, a little bit like the way I felt about reading Hush Hush. Maybe I shouldn't read as many reviews for bestsellers, because this is the second time my expectations were high and the book did not live up to those expectations. This was another slow read, the book finally took of when Schuyler finds out the truth about her heritage (which is somewhere in the second half of the book). The first half of the book was not really exciting not much happend which made it hard to pull through. The second half of the book is were it got interesting, the whole new vampire world build in this book is a refreshing change in the world of vampires we living. These is a whole new brand of vampires and I would love to read more about it in the second book. What kept me reading was the excellent language use, the choice of words made some of the sentences almost poetic. Also the choice of words changed with the time and the person who spoke. Which gave great dimension to the characters. Which would have been very one dimensional otherwise. I hope that the second book in the series, speeds up a bit and I hope that the characters are more developed. I am looking forward to the next book because I am curious about what it might bring. Because this book was very enjoyable, the writing style is phenomenal but the first half of the book was pretty slow, which was utterly disappointing. I could put this book down very easily and my expectations were way to high. So this leads to an average book which means I give this three skaters! I finished this book a while ago, and then I didn't have a song for it, then I looked up the lyrics (something I often do) to Royals by Lorde and thought of Schuyler. So here it is!